The AGT800 Laser Pipe & Pole Measuring System is designed for measuring wall thickness. 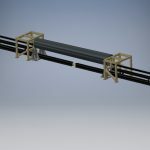 It is a turnkey solution which utilizes two synchronized systems that moves in and out of the pipe on either side. It provides fast and reliable thickness measurements and S.P.C. reporting using the latest in laser triangulation technology. Direct benefits realized through these measurements include documented compliance with ISO9002, QS9000, and other quality specifications, improved process control, increased productivity, and scrap reduction. The standard system also provides disk and/or network data storage and easy recall of all S.P.C. information. This feature eliminates the need to maintain large files of printer paper for long-term record-keeping purposes. The AGT800 Laser Pipe & Pole Measuring System is an optical based measuring system. 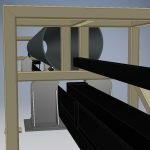 Two non-contact, high precision semi-conductor laser sensors are mounted above and below the pipe or pole to be measured, and their beams are focused on the same spot on either side of the target material. Each sensor emits a Class II laser beam and receives the beam back on a RS-CMOS pixel array. 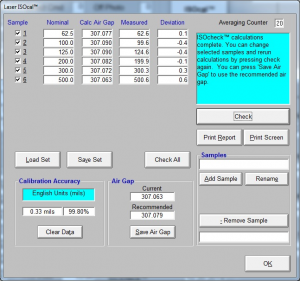 The gauge determines the distance to the target material and precise material thickness is then calculated. The system is calibrated based on this data allowing it to provide continuous, high speed, non-contact, accurate and reliable thickness measurements. The AGT800 Laser Pipe & Pole Measuring System presents a graphic representation of wall thickness over the length in chart fashion, and indicates location of out of tolerance material. In addition, this report presents a histogram of thickness distribution, footage, weight, average thickness, UCL, LCL, UTL, LTL, X Double Bar, R Bar, Cp, Cpk, and CR. This entire report is automatically scaled to fit on a single page, allowing for much neater record-keeping. During normal operation, an interactive display shows real-time graphical representations of measured wall thickness, deviation, and a histogram of thickness values for the current pipe or pole being measured. Also displayed are thickness, target, upper and lower tolerance limits, job number, coil number, shutter status, coil footage, coil width, defects if selected, product, and much more. 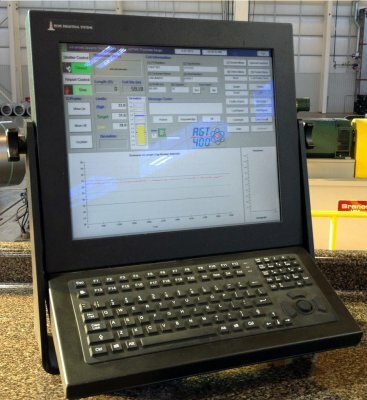 Additional display screens are provided for next pipe/pole data, profile (thickness versus width), product setup, defect setup, report setup, calibration, diagnostics, message review, and data recall. 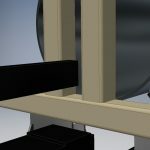 C-frames typically mount on two pedestals, and there is no requirement for water. Simplified hardware configuration increases the reliability of this gauge. The measurement system utilizes the latest in technology, reducing the requirement for peripheral hardware. 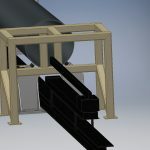 The system configuration provides a very reliable platform for thickness measurement and S.P.C. reporting. Our system features a fast and accurate calibration cycle, called ISOcal™. Our unique system design enables future upgrades to be performed in the field, in a matter of minutes. Advanced Gauging Technologies is a service oriented company, and for that reason we’re proud that all of our thickness gauges have incredibly useful built-in diagnostic features. The Diagnostic Data Screen shows the real-time status of all digital and analog I/O, nominal and actual power supply voltages, and much more. All of the major test points in the system are displayed simultaneously, making troubleshooting a very straightforward process. This screen can easily be printed and emailed or faxed to A.G.T. for troubleshooting assistance. The AGT800 uses ISOcal™, which is the most advanced calibration routine available on the market today. This procedure can be performed in less than five minutes. N.I.S.T. certified samples are placed on a custom fabricated sample holder. Data is calculated and statistical outliers are automatically removed by the program. The calibration is then determined using all valid data points, and C-frame temperature is stored at that time. Once the calibration is saved, all future measurements are temperature compensated to automatically account for expansion and contraction of the C-frame.